We’d love your help. Let us know what’s wrong with this preview of Runaway Clothes by Mrs. D.. 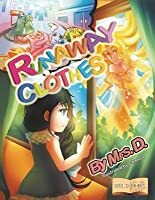 Preview — Runaway Clothes by Mrs. D.
To ask other readers questions about Runaway Clothes, please sign up. One morning when the little girl woke up, to her huge surprise, she could not find her clothing. Standing in front of her empty closet, she tries to find out what happened to her clothes and why her favorite dresses, pants, and shirts left her on this misty morning. How dare they leave her with just her summer pajamas? Sound familiar? At first, Nika tries to blame the poor hangers, but the hangers have had enough of her unplea An instructive and incredibly beautiful story with a happy conclusion. Runaway Clothes by Mrs D. had me thinking, "Oh yes, we've been there!" In this funny little story, a little girl opens her closet to learn from the clothes hangers, much to her dismay, that her clothes have run away. They were tired of being left on the ground, crumpled up, and treated so poorly. As the little girl surveys her room, she also sees how all of her toys are also sad from being neglected and piled uncomfortably one on top of the other. Before long, the little girl is feeling dejected Runaway Clothes by Mrs D. had me thinking, "Oh yes, we've been there!" In this funny little story, a little girl opens her closet to learn from the clothes hangers, much to her dismay, that her clothes have run away. They were tired of being left on the ground, crumpled up, and treated so poorly. As the little girl surveys her room, she also sees how all of her toys are also sad from being neglected and piled uncomfortably one on top of the other. Before long, the little girl is feeling dejected realizing that she has not been taking good care of her belongings. In Mrs D's unique storytelling style, the reader is treated to a delightful tale brought to life through beautiful and colorful illustrations. As with previous books, I love how inanimate objects are given life through both the writing and the pictures making this book perfect with children (and grown-ups) who have vivid imaginations. Without giving the ending away, I think most parents will be able to relate to the underlying message about teaching children to clean up after themselves, be it their clothes or toys. How many times have I heard, growing up, "If you don't take care of your things, one day they will run away!" I love the underlying message of the story and I recommend this wonderful book to school classrooms, library circles, and parents who wish to read a lovely tale with a moral about taking care of our belongings, to children ages 5 to 10. Runaway Clothes by Mrs D. had Runaway Clothes by Mrs. D is full of delightful imagery. A little girl opens her closest, and oh my, her her clothes have disappeared,money have run away. The world flows in such a hmmmmm....fanciful way? Shall I say? That my goodness children will sure become engaged as well just sucked completely into this story as if they were in it them selves. The young girls clothes became tired of being crumpled and feeling abounded on the floor, on the ground and all around being treated so ......unfortunately poorly and nasty. The little girl starts to notices that not only her soothes were being treated so bad but her toys, and they were sad from being unnoticed, neglected as well as sad as being piled on top of each other. The wonderful story has a of importance, teaching teaching the ones who read a lesson, a valued lesson. A lesson that will teach the young, I will even go as far as saying the "older" because we all tend to forget sometime the value of ANY OF YOUR POSSESSIONS. The value of your BELONGINGS. Mrs.D. Does it in such a way that you will not realize you are learning a loess on just reading a fantastical good story but subconsciously you realize the message, a message off taking care of one, or your things. And a great message it is. This is a delightful tale about a little girl who finds all her clothes missing one fine morning. She then realises the importance of looking after her things. This is an enchanting picture book for children and even though it is a story about a girl, all children can learn from this book. It has very beautiful pictures with full page color illustrations. The cute little girl, her messy room, sad toys and angry hangers; are all a delightful combination. It is a story meant to be read again and aga This is a delightful tale about a little girl who finds all her clothes missing one fine morning. She then realises the importance of looking after her things. It has very beautiful pictures with full page color illustrations. The cute little girl, her messy room, sad toys and angry hangers; are all a delightful combination. It is a story meant to be read again and again, with a message and moral for all children. Read it to your child and help them learn the right way of taking care of their things, books, toys & clothes. Flipping through the colourful pictures older children can understand the story and would be encouraged to read on their own. The Runaway Clothes makes you want to cherish the clothes and the book. When I saw the cover of this book, I thought, “This would be perfect for my 7-year-old Ella who doesn’t like to keep her things and toys in order.” She just leaves them lying around, and I really get annoyed that someone has to clean up after her. I sometimes feel like a nagger as I tell my children to clean up, every.single.day! I want them to learn to put their things in the proper place because the helper and I will not always be around to do that. See full review: http://www.cymplified.com/20 When I saw the cover of this book, I thought, “This would be perfect for my 7-year-old Ella who doesn’t like to keep her things and toys in order.” She just leaves them lying around, and I really get annoyed that someone has to clean up after her. I sometimes feel like a nagger as I tell my children to clean up, every.single.day! I want them to learn to put their things in the proper place because the helper and I will not always be around to do that. Do you have a young lady in your home who is a less than perfect housekeeper? This book might be just what the doctor ordered. Nika is a wide-eyed pretty little lass who awakes one morning to find that all her clothes are missing from her closet. Both the metal and wooden hangers are bare. She looks outside her cold window and sees only the mist. Where can her clothes be hiding? Nika is freezing because she is dressed only in her pajamas. She does not know what to do. Then she gazes around her ro Do you have a young lady in your home who is a less than perfect housekeeper? This book might be just what the doctor ordered. Nika is a wide-eyed pretty little lass who awakes one morning to find that all her clothes are missing from her closet. Both the metal and wooden hangers are bare. She looks outside her cold window and sees only the mist. Where can her clothes be hiding? Nika is freezing because she is dressed only in her pajamas. She does not know what to do. Then she gazes around her room and observes that all her toys are lying around in disorganized heaps. What if they decide to abandon her as well? Nika panics. So she purposefully sets out to clean and organize her toys and stuffed animals. That does not resolve her dilemma. It is cold outside; how will she ever be able to leave the house without her clothing? Nika talks to the trees and the sun rays who are both sympathetic. The wind blows her salty tears and they land on her clothing, which it turns out, are closer than Nika is aware. Does Nika ever find her wayward clothing? At the end of the story, Nika's mom is really impressed with her daughter because she has learned a few valuable lessons. “Runaway Clothes” by Mrs. D. joins this author’s growing list of good quality children’s books. The illustrations in this volume are superbly drawn by the very talented Chanoa, making this a delight to read, regardless of your age. Young Nika awakens one morning to discover all her clothes are missing from her closet. She asks the hangers what they did with her clothes, but only manages to anger them, so the hangers run away, too. After pouting for a bit, Nika realizes she did not treat her clot “Runaway Clothes” by Mrs. D. joins this author’s growing list of good quality children’s books. The illustrations in this volume are superbly drawn by the very talented Chanoa, making this a delight to read, regardless of your age. After pouting for a bit, Nika realizes she did not treat her clothes very nicely, so it’s her own fault they ran away. This epiphany makes her realize that her toys might also become sufficiently disenchanted to run away, and then how would she cope? To prevent such an eventuality, Nika decides to clean up her room like never before. She puts everything very neatly in its proper place, but is that enough to encourage her clothes to return to her closet? “Runaway Clothes” is richly illustrated, with a hint of Anime influencing the drawings. The text of the story meshes perfectly with the illustrations; so much so, that you will find yourself pausing on each page to carefully peruse the illustrations after reading the text. Mrs. D. has firmly established herself as one of this generation’s premier children’s authors. Readers are encouraged to visit her website, http://www.mrsdbooks.net/, for video trailers for each of her books… a definite plus when you need to select only one or two books out of a dozen or more choices. All of Mrs. D’s books that I’ve so far read have been based on actual events in her life, which makes it very easy to relate to them. If you’ve not yet discovered Mrs. D, “Runaway Clothes” is an excellent one with which to start. You will grow to treasure all her stories. If the colorful writing does not yet engage the youngest of readers, the beautiful illustrations are Runaway Clothes by Mrs. D is full of delightful imagery. The words flow in such a fanciful way that children are sure to be immediately engaged and pulled into the story. Its endearing quality teaches young ones the importance of taking care of their valued belongings in such a way that they will not realize they are learning a lesson in the proper care of one's possessions. Excellently executed! One day young Nika wakes up to discover her closet is bare. Upon discovery of her empty wardrobe her hangers gleefully announce that Nika's clothes have had enough of her mistreatment and have decided to run away. It seems Nika has cared for her clothes quite poorly. But as Nika laments the loss of her favorite clothes she looks around her room at total disarray. With toys stacked upon one another in chaotic disorder, she is struck with a terrible thought. What if her toys were to decide to leav One day young Nika wakes up to discover her closet is bare. Upon discovery of her empty wardrobe her hangers gleefully announce that Nika's clothes have had enough of her mistreatment and have decided to run away. It seems Nika has cared for her clothes quite poorly. But as Nika laments the loss of her favorite clothes she looks around her room at total disarray. With toys stacked upon one another in chaotic disorder, she is struck with a terrible thought. What if her toys were to decide to leave her as well? With a little help from her friends Sun and Wind, Nika learns a valuable lesson about treating her things with respect. Author, Mrs. D., has written a beautiful book full of wonderfully imaginative scenarios and lovely imagery. Runaway Clothes is sure to strike a chord with young readers, inspiring them to take good care of their belongings. Runaway Clothes is recommended for home and school libraries. Nika is shocked to find that her clothes have disappeared and now her hangers are leaving as well. Bewildered by this development, Nika begins to reflect on her treatment of her beautiful clothes. She remembers that she often threw them on the ground or stuffed them in her drawer. As she cries she notices her toys are scattered about her room. Worried that they too will le Runaway Clothes is a whimsical and charming tale that educates children on the importance of taking care of their belongings. Children will be drawn into the story by the easy flow of the tale. The beautiful illustrations will delight What a lovely way to teach children how to be neat and tidy and take care of their things. Mrs. D has the innate ability to tell a story in a fascinating way that grips the little readers. She creates a fantasy world where clothes can talk and the elements - wind and sunlight are the character's friends. Her books enable children to believe that anything is possible when you make believe. Runaway clothes is a little story to teach children the importance of respecting the objects they own. We are taken on a journey of Nika who is missing all her clothes. As a result she figures out that if she does not want to lose all her things, she has to take better care of them. It is also a refreshing story for parents to learn that it is important to praise little ones for the good deeds they do. I would see the target age group for this book to be 1-3rd grade level. I give this 4 fangs. A light-hearted lesson in tidiness. The little girl unwittingly neglects and abuses her clothes and toys, until one day the clothes go missing and their absence makes her heart grow fonder! A useful story for anyone with a child who doesn't respect their belongings. It's fun and non-preachy and might provide some food for thought in a non-confrontational way. 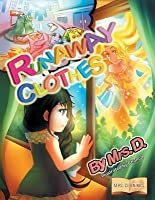 "Runaway Clothes" written by Mrs. D is one readers will enjoy, and possibly learn a lesson from this tale. Nika's clothes run away after not being put away properly. Her toys too, are in a bit of a dilemma of her untidy ways. This was a fun, descriptive, and entertaining book to read. Nika wakes up one morning to find all her clothes missing. Then the grumpy old wooden hanger tells her a few things she doesn't want to hear about how she's been treating her belongings. Will Nika change her lazy ways? This is a cute story, but the ending is a bit contrived and predictable. I felt like I was being hammered over the head with the lesson the story was so obviously trying to teach. The author's writing style is beautiful, though a bit too old-fashioned for this modern tale. The subj Nika wakes up one morning to find all her clothes missing. Then the grumpy old wooden hanger tells her a few things she doesn't want to hear about how she's been treating her belongings. Will Nika change her lazy ways? This is a cute story, but the ending is a bit contrived and predictable. I felt like I was being hammered over the head with the lesson the story was so obviously trying to teach. The author's writing style is beautiful, though a bit too old-fashioned for this modern tale. The subject matter would be better served by a simple picture book, with much less text. Olga D'Agostino (known as Mrs. D.) is an award-winning children’s author (recipient of multiple Mom’s Choice Awards, Beverly Hills Book Awards, and International Readers’ Favorite Awards). She lived and worked in Lviv, a cultural center in western Ukraine, before immigrating to the United States in 1992. In 2012 she published her first children’s book, and since then she’s pursued a career as a wr Olga D'Agostino (known as Mrs. D.) is an award-winning children’s author (recipient of multiple Mom’s Choice Awards, Beverly Hills Book Awards, and International Readers’ Favorite Awards). She lived and worked in Lviv, a cultural center in western Ukraine, before immigrating to the United States in 1992. In 2012 she published her first children’s book, and since then she’s pursued a career as a writer, focusing on writing children’s books that have meaning and provide valuable lessons. She speaks many languages, loves reading, writing, gardening, and traveling. Her award-winning illustrated children’s books include The Trees Have Hearts, Good Morning, World!, The City Kittens and the Old House Cat, Runaway Clothes, The Little Girl Praying on the Hill, and The Royal Palm. She lives in Smithville, NJ, with her husband, Patrick. They have four children and four grandchildren. Her unpredictable calico cat, Nyda, was the inspiration for many of her stories. Carlo the Mouse, Book 2: Now We're Talking! Carlo the Mouse, Book 3: What's Going On? Carlo the Mouse, Book 6: That’s My Life! Her books are available in print on Amazon and Barnes & Noble, and as e-books for most popular e-devices. The full series of Carlo the Mouse and her new books "The Cat Who Wonders by Itself," and "What is GOOD and What is BAD? will be published in the near future. She is presently working on her novel, The Chinese Princess.